Large - £32.99 Only 1 left! We think that Boba Fett is a pretty cool guy. He’s a fearless bounty hunter who never stops until he gets what he wants. In a lot of ways, little girls are very similar: fearless, unrelenting, and driven. That’s why we think it’s pretty cool that girls can get in on the Boba Fett craze now! 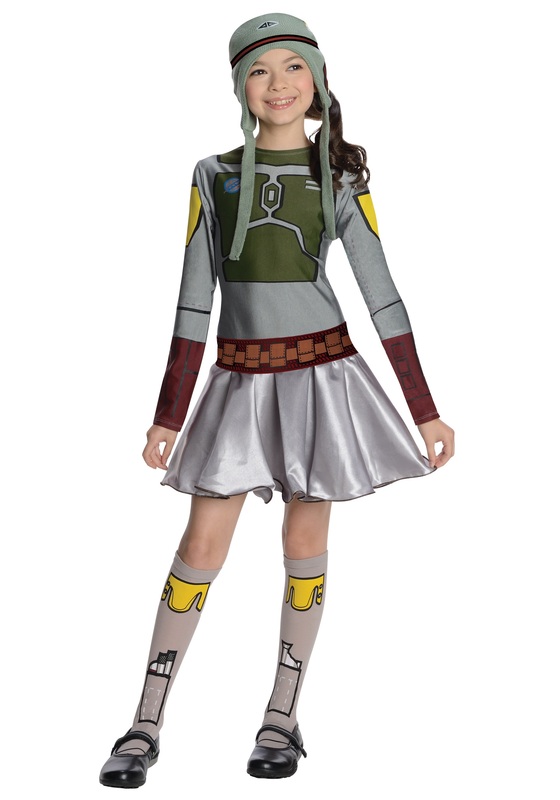 Give your child a chance to become one of the most feared bounty hunters ever when she wears this Boba Fett girls dress costume. She'll be feared by both Rebels and the Empire when she flies around the galaxy looking adorable in this cute dress and hat look. This is a great costume for any young Star Wars fan and pairs great with our awesome Boba Fett accessories. This officially licensed Star Wars costume for girls is just what your little one wants for Halloween. The dress is made of 100% polyester so it’s comfortable to wear all night long (after all, we wouldn’t want her to have to bring her ship back early on Halloween night). The gray dress is printed with Boba Fett armor details and also has a brown belt with printed on pockets. The Star Wars costume also includes gray knee high socks that are printed with boot details so you can get the complete look without having to trudge around in heavy boots. Top off the entire look with the gray stocking cap. The cap is printed with Boba Fett’s helmet details and has hanging tassels. The perfect Star Wars costume for your little fan!